Co-hosted by Viet Tan, the 1st Vietnam Cyber Dialogue (VCD) aims to gather community leaders, activists, policy makers, and technologists working towards improving access to information and greater freedom of expression in Vietnam. The one day event hosted at the Internet Freedom Festival in Valencia will look at the role that technology, media, government and civil society play in shaping an ecosystem that supports these rights. A rapidly shifting technological and new media landscape has caught millions of Vietnamese unaware as a growing online community accesses and imparts information over the internet. Rising tech start-ups and an increasing number of bloggers face both challenges and opportunities as they weave through the cyberspace. 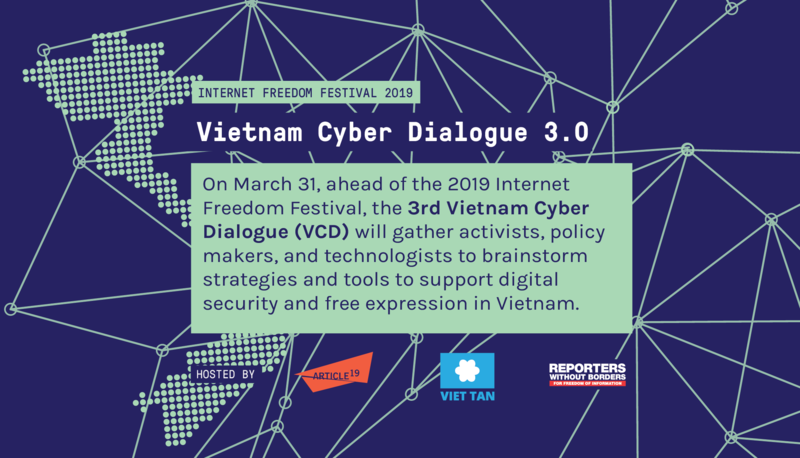 Co-hosted by ARTICLE 19, Reporters Without Borders and Viet Tan, the Vietnam Cyber Dialogue (VCD) at the 2017 Internet Freedom Festival aims to delve into these issues concerning both technology and basic freedoms. The VCD will be facilitated by Allen Gunn from Aspiration. 1. 50 million of Vietnam’s 95 million citizens are online as of 2016. Facebook is the most popular social media site, with 37 million users expected to use Facebook this year. 2. Facebook has been a critical tool for civic action with netizens organizing petitions and protests. 3. According to Article 19, the Vietnamese government has used various tactics to clamp down on online speech through aggressive filtering, malware, and repressive decrees. 4. 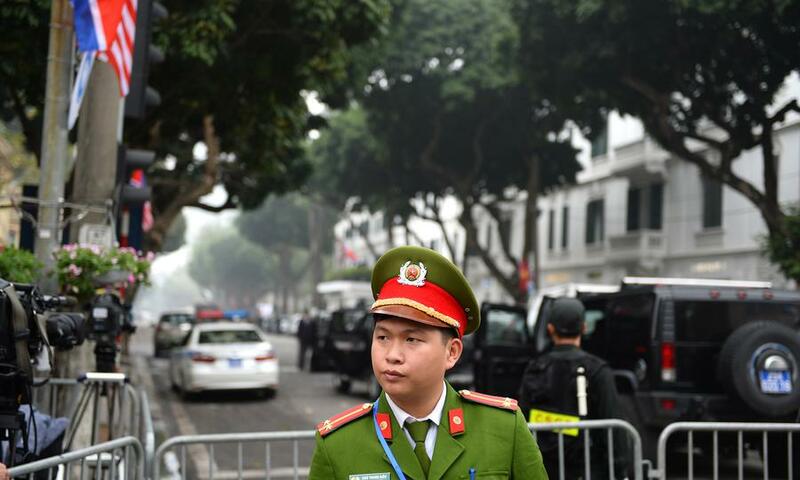 The Vietnamese government has previously intermittently blocked various social media sites during times of heightened political sensitivity including the recent protests following Vietnam’s largest environmental disaster. 5. Telecommunications providers blocked text messages containing the word “bầu” (“vote”…but also meaning “pregnant”) during Vietnam’s National Assembly elections in May 2016. 6. Activists have been arrested and charged for “abusing their democratic freedoms” based on their Facebook posts. There are more than 15 bloggers who are currently detained for “conducting propaganda against the state” under Article 88. 7. 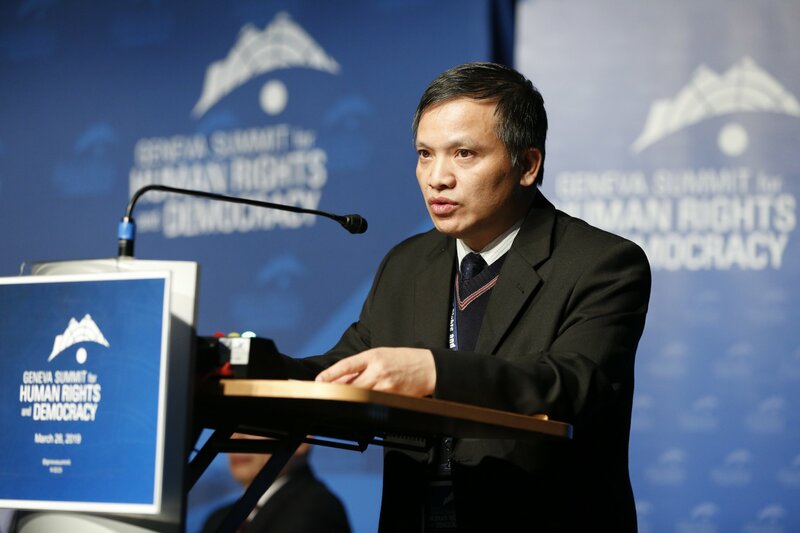 In response to growing dissatisfaction among Vietnamese, a coalition of organizations created a mobile app to allow users to freely express their political views ahead of the single-party National Assembly elections in 2016. 8. The Vietnamese government hires people to monitor online activity and act as “public opinion shapers” (i.e. online trolls). 9. A police general bragged that his unit at the Ministry of Public Security was responsible for taking down 300 “dissident” websites. 10. Reporters Without Borders has declared the Vietnamese government an enemy of the Internet and ranked Vietnam 175 out of 180 countries on its World Press Freedom Index. Vietnam has seen millions of people jump online over the past decade, now with the largest number of internet users in Southeast Asia. Mobile devices have become the gateway for Vietnamese to access the internet, connecting people to information and with each other more simply than ever. Social media sites have become platforms for netizens to express themselves and collaborate. Safer and more secure communications are key. Many netizens readily click on suspicious links despite the risk of viruses and malware. Long term trust in tools and services shape the choices Vietnamese make, with many opting to use platforms such as Gmail which are publicly available and have a reputation among netizens as being secure. During politically sensitive times, many face censorship. Text messages mentioning names of Communist Party of Vietnam leaders were blocked by telecommunication companies during the 12th Party Congress in early 2016. State censorship is a major setback for netizens to freely express themselves online and offline. And with state-sponsored monitoring of social media posts and data storage, bloggers and activists find themselves in danger of online acts of harassment and intimidation. VCD is an outcome-oriented event, bringing together technologists, policy-makers, practitioners, and journalists to discuss physical and security challenges when working in a Vietnamese environment both inside and outside of Vietnam. The VCD will be conducted under Chatham House Rule to provide a safe space for attendees to produce collaborative solutions. Aspiration’s mission is to connect nonprofit organizations, foundations and activists with software solutions and technology skills that help them better carry out their missions. ARTICLE 19 defends freedom of expression and information. ARTICLE 19 fight for all hostages of censorship, defend dissenting voices that have been muzzled, and campaign against laws and practices that silence. Reporters Without Borders (RSF) has been defending freedom of the press and freedom of information for over 30 years. Thanks to its unique global network of 150 local correspondents investigating in 130 countries, 13 national offices and a consultative status at the UN and UNESCO, RSF is able to have a global impact, gather on-the-ground information, conduct major advocacy campaigns, and assist and defend news providers all across the world. One signature project is Loa, an English-language podcast covering current affairs, culture, and politics in Vietnam.